I have xcode 4.5.1 and want to add photos to the iphone 6.0 simulator but cant find it. I have a folder named iphone simulator but it just contains 4.3.1. It may be because some months ago I drag almost everything in the application support to my extern hard drive to save some memory. Now when I drag it back it contains the 4.3.1 which I used before. Do I have to download something on new or what should I do? Thanks in advance! Update for iOS9: Locally stored images can be dragged directly onto the simulator and don't have to be saved explicitly. Unfortunately you can't just add images to that folder as they will be ignored because they're not in the image database of the Simulator. However you can get all the stored images via the Finder. With Xcode 6 is easier. 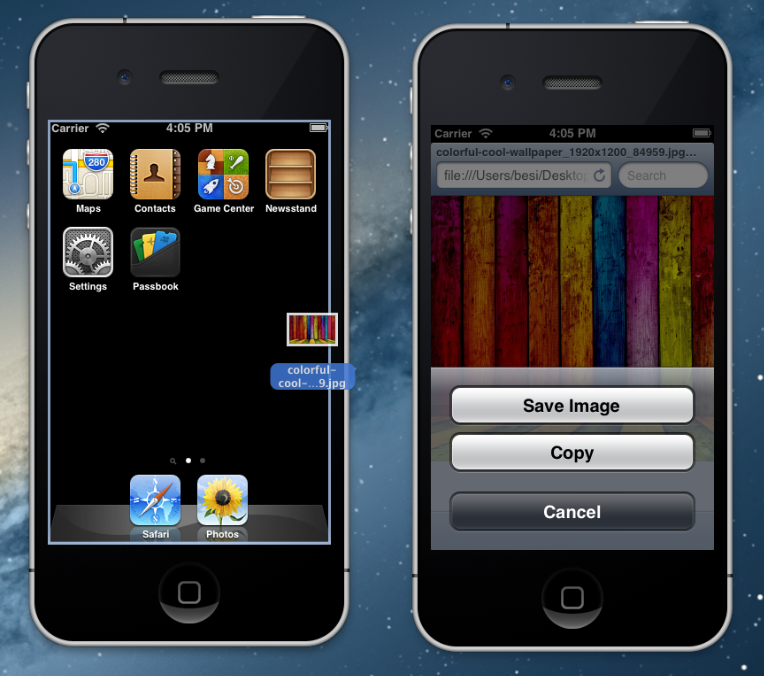 1.- Drag and drop an Image to the Simulator and the image will appear directly in the native Photos app. With the drag and drop feature you will lose all the metadata of the photos. I've created a project that make it really easy to import assets to the simulator: MBAssetsImporter. It enables you to import both videos and photos while preserving all the original metadata of the files. This is MUCH easier with the new iOS Simulator that comes with Xcode 6+ (iOS Simulator 8.1 and above.) Now all you have to do is drag one or more photos onto the iOS Simulator window, and instead of opening Safari, the Photos app opens, and instantly adds all dragged-in photos to the device. You can also now do this through the command line with smctl addmedia command. You can specify multiple files including a mix of photos and videos. You can also specify multiple live photos by providing the photo and video files. They will automatically be discovered and imported correctly. Note (you may not need to add xcrun in front of simctl depending on how command line tools are installed). It's simple. Just goto photos in your iPhone simulator and drag images from your location (where the images Eg.Desktop) to IphoneSimulator. It add these picture in camera album. Another easy way, in High Sierra with XCode 10, with your simulator running, select your photo in Photos, go the Share menu and select "Simulator". Not the answer you're looking for? Browse other questions tagged ios iphone xcode ipad ios-simulator or ask your own question. How to add videos in iPhone 6.0 simulator? How to add photos to iOS simulator to test working with a huge photo library?